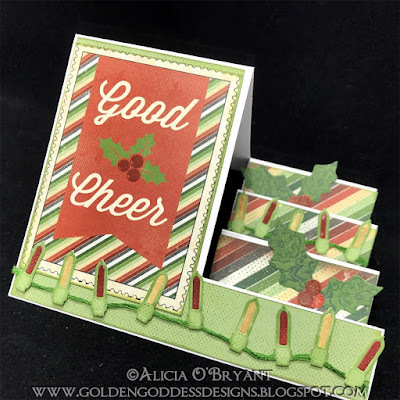 Blog Quick Quotes: Holly Jolly Holiday with Alicia! Holly Jolly Holiday with Alicia! 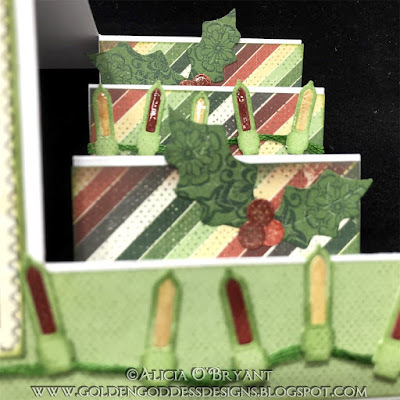 Hello, Alicia with you today with some holiday card inspiration! I used a special fold to create some good cheer for the upcoming holiday season. I used a die to create this side step card but prior to owning it, I followed simple instructional videos to make several different styles of step cards. I used a papers and a sentiment from the new Holly Jolly Holiday collection. A tip for creating detail die cuts is to add layers of papers, bling, ribbon and inking making simple paper pop. I used different color papers for the inside segment of the lights. I also used different reds for the berries on the holly. I added glossy accents to both to add life. Sending you good cheer and thanks for stopping by today!